Everybody loves a sport wagon. Well, everybody in the automotive press does anyway. Something that’s useful when you need it to be and fun to drive the rest of the time is very appealing to us, and this is the Lancer Sportback all over. The price is appealing, although the car does have a few drawbacks, most notably a horribly cheap interior. 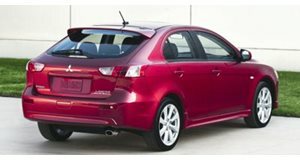 There are a number of hatchbacks out there which realistically offer a better value. The Lancer does offer a large volume of cargo space though, and in Ralliart trim is a lot of fun to drive.